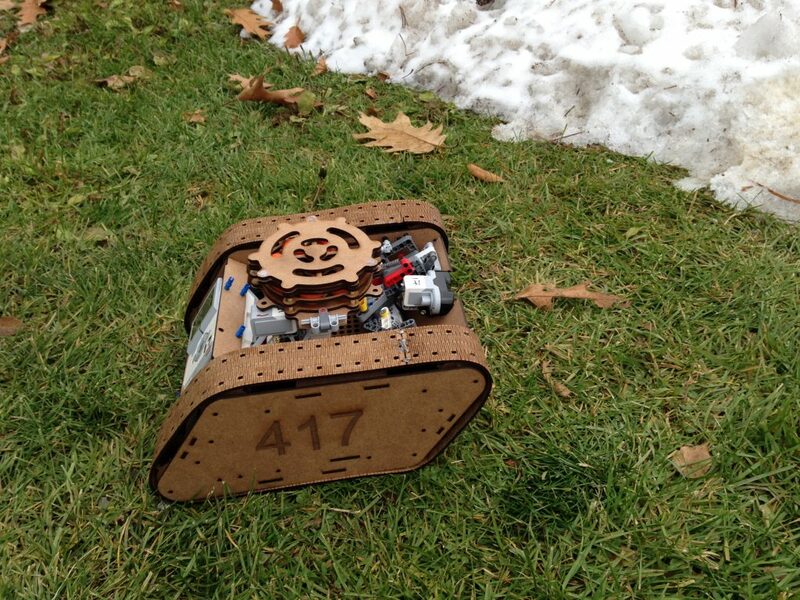 For the final project of my 1A term in Mechatronics Engineering, we created a laser cut tank with the Lego EV3 kit (this was required) that shot Nerf balls, all to achieve a very special purpose: to remove the geese from the University of Waterloo campus. 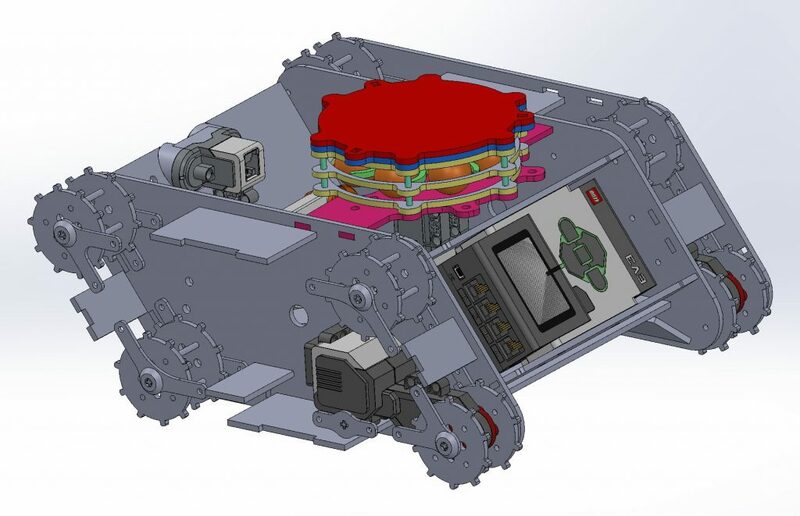 There are lots of pictures of the tank below, and our design reports are attached as well, but I would like to highlight something here as well. Before going further, I would also like to give credit to my amazing groupmates Caleb Dueck and Lukas Wormald. This project was truly a group effort, and I could not have asked for better groupmates. 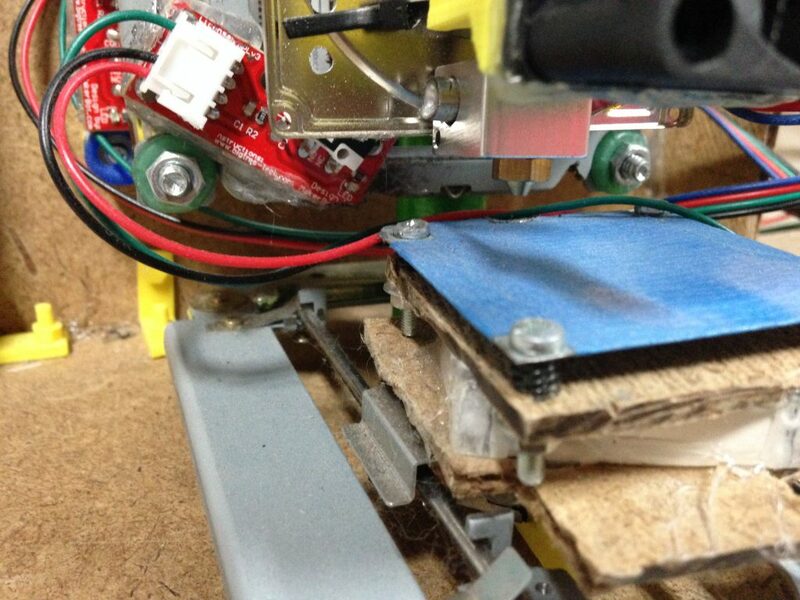 The treads are made out of laser cut 3mm MDF board. 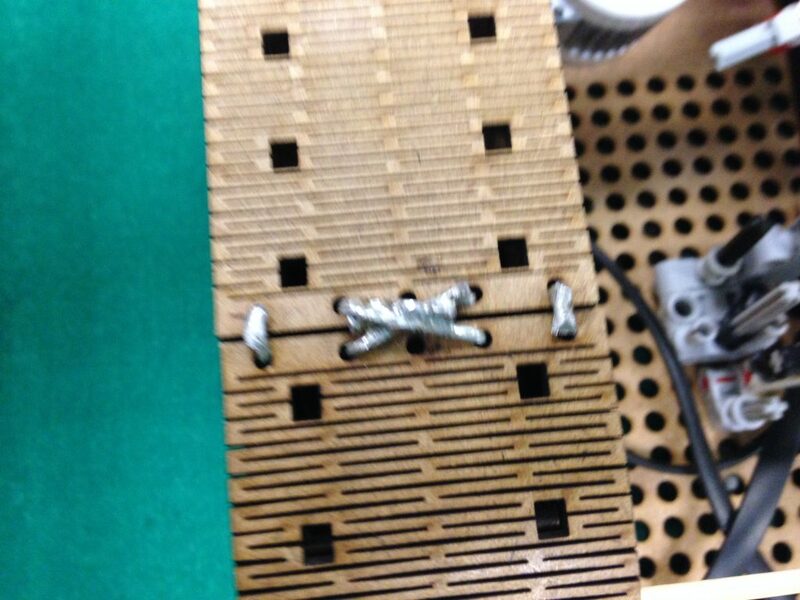 Using cutting a flexible pattern in to the wood, we were able to create a fully functioning tread. 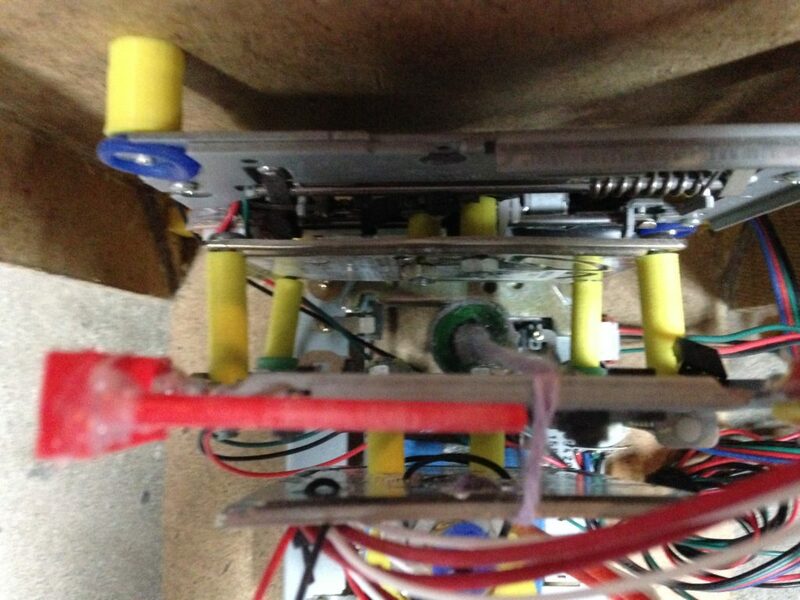 We attached both ends of the tread using 18AWG wire loops soldered through holes in the ends of the treads. The gears were made from This may not have been the best option for the treads, but it worked fairly well and was easy to do. The treads were not durable in the wet weather outside and one of them broke as it got wet and soggy. 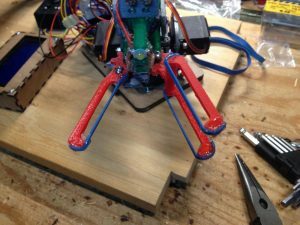 The ball hopper mechanism was inspired by the design of paintball hoppers, and laser cut out of 3mm MDF. It worked very well at slow speeds, and was very repeatable. The top cover is attached with magnets and is removable in order to reload the hopper. If we were given more time and resources, we would like to have made the balls fire faster and further using compressed air instead of a spring. However, the spring powered solution worked fairly well after some tuning, but would not fire as straight or as far as was originally planned for. 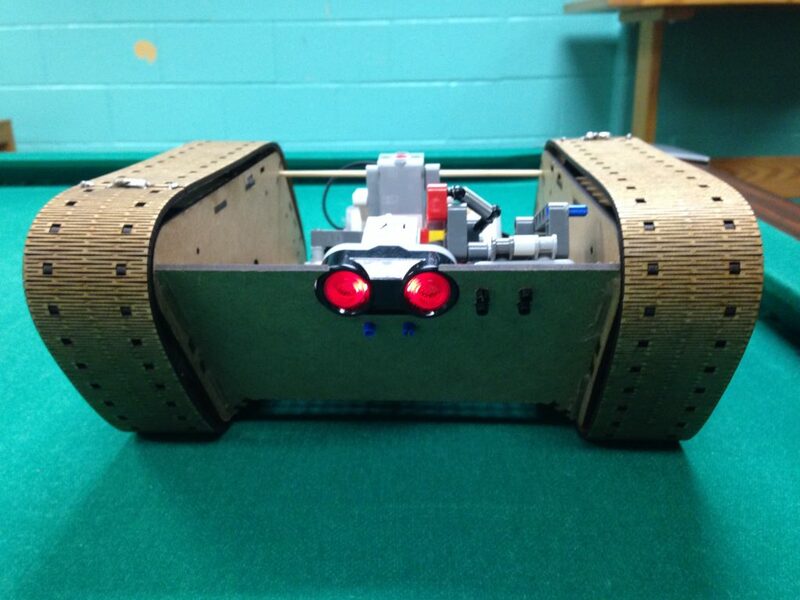 Using the Lego EV3 Robot kit was a requirement for this project, driven by the school, as these kits are easy to debug. If we were given more time and more freedom, we would have used an Arduino based platform instead, as this gives more expandability, power, and features. The design report that we produced covering all the design decisions that were made is available here. 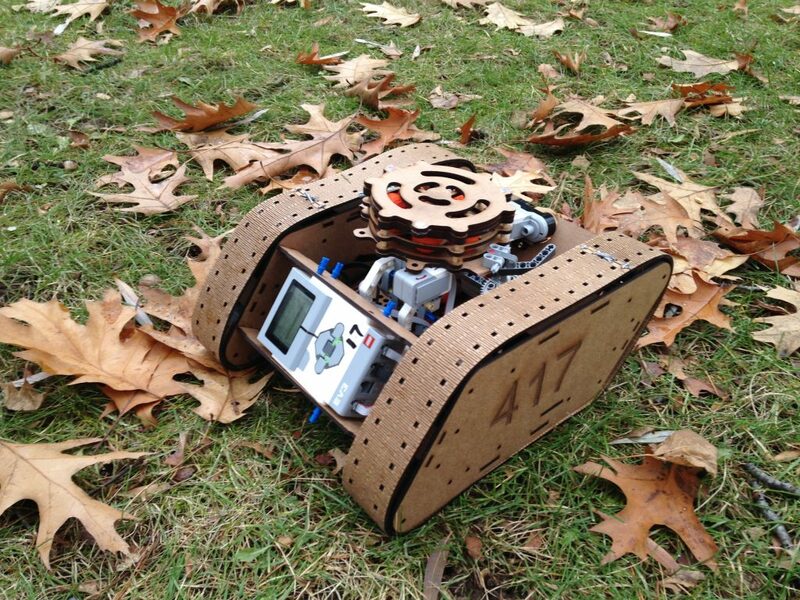 Videos of the robot in action can be found here. Again, a long overdue project article, but I am slowly getting through them. This project originally started when I made a mini piano on a 400 point breadboard with screws as the touch sensitive keys. I was looking for an easier way to make keys that are secure, but extremely easy to make and assemble. The ideal solution would have been a tool-less, solder-less version that costs almost nothing, but I have yet to find such a solution. So, I designed a PCB to the 3 components of the piano, and used very large, circular SMD pads as the touch sensitive inputs. Making a PCB allowed for a much smaller footprint, as well as easier assembly although there is soldering involved now – for me it is easy, but for others possibly not. I may get to the point where I offer this kit as a beginner’s electronics kit, or as soldering practice like many kits I have seen on eBay. After a year or so of using it and watching other people use it, I would have made the touch pads bigger, and would love to figure out a way to play more than one tone at once to create a harmonic. This article is long overdue – it is for a project that I completed while still in the early years of high school. The same goes for many of the next articles and projects I will be posting. 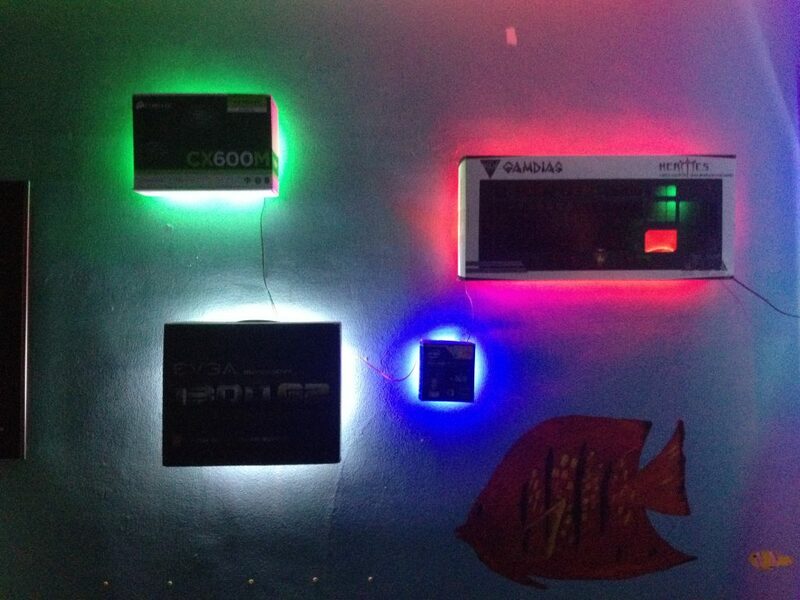 One day, I decided it would be cool to mount the boxes of computer parts on the walls and backlight them with LED strips. The next weekend, that is exactly what I did. I used some 1cm x 1cm wooden strips to create a square slightly smaller than the sizes of the boxes that I will be mounting. 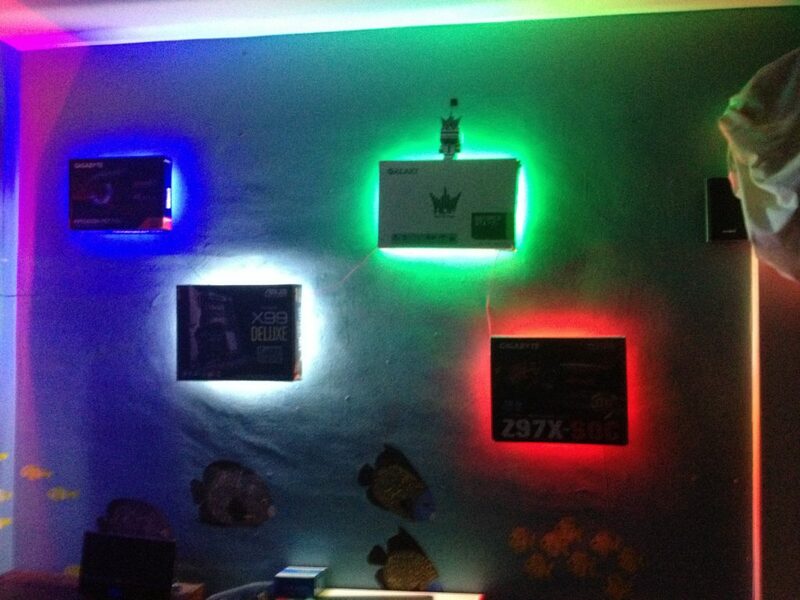 To those squares, I attached the LED strips which were different colors to match the main color of the boxes. Once mounted, this created an effect somewhat like a floating box, with the light coming from behind, and no visible shelving to hold the box up. 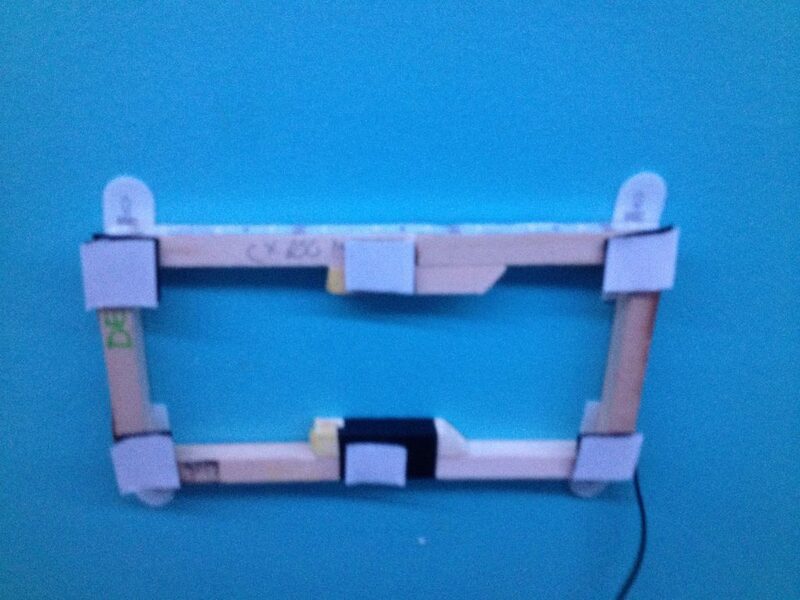 To mount all this to the wall I chose the non-permanent method of double sided tape in the form of 3M command strips. I did not want to damage the boxes either, in case I ever needed to return any of the parts that they originally contained, so I used adhesive backed velcro to them to the wooden frames. Now for the power, these LED strips need 12V which is perfect, as I have a computer power supply that provides 12V for the overhead lighting as well. I stuck an extra connector and switch on the end of a pair of wires and connected that to the closest box. To attach the rest of the boxes, I soldered wires between the 12V and GND traces of the LED strips, at the closest points between the boxes. Fast forward a few years to when I am now writing the article, I am somewhat surprised that these held up so long. The 3M command strips are just now starting to lose their stickiness. 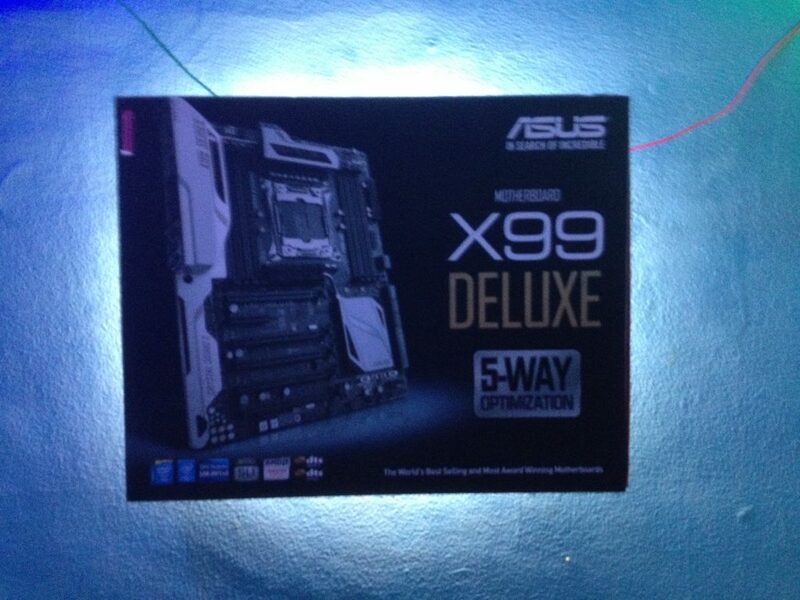 As for the lighting, it still works perfectly, but I did not use it as much as I had expected. The LEDs were too bright to wire in to the main light switch, so I left them on a separate switch and only really ever used them as a showpiece. If I were to do this again, I would make the LEDs dimmer by driving them from 9 or 10V instead of 12, and wire them in to the main light switch so that they are not too bright. I have always been a fan of fixing my own stuff. So when my iPhone battery died, I bought a cheap Chinese replacement and a screwdriver kit from eBay to replace it myself following an iFixit guide. The process was super easy, and I had everything working again in less than 10 minutes. However, this did not come without its consequences. A few days ago (months now), while charging my iPhone 4S – yes, its old but it works – , I heard a ‘pop’ and felt the phone expand. I took the case off as quickly as I could, and saw that the back of the phone had popped open because the li-ion battery had swelled up – never a good sign. Surprisingly, the phone was still on at this point, so I shut it off and tried to get the back panel off. I took out the 2 screws, but before continuing to remove the battery, decided to turn it back on and get the pictures off of it. I wasn’t sure if the battery was going to continue expanding when I plugged it in to my computer to take this pictures off, as this would also continue charging it. In the few minutes that it would take me to get the pictures off, it would not transfer too much energy to the battery, so I decided to take the chance. I was able to successfully remove all the important data, then unplugged the phone and removed the battery without further problems. Let me be clear that this battery was NOT the original iPhone battery. I had replaced it about a year and a half ago, with a cheap replacement battery from eBay. I wasn’t expecting the replacement battery to last a long time, but it managed over 500 charge cycles, which is not bad for a cheap chinese battery. It is definitely much better than those ‘UltraFire’ 18650 cells out there. I have been buying Chinese parts for years, and have never had any problems with them, when treated correctly. Batteries are one thing that I will avoid buying from China in the future. This also speaks to a project philosophy that I have been thinking about and working on recently – If its worth doing, then its worth doing well. 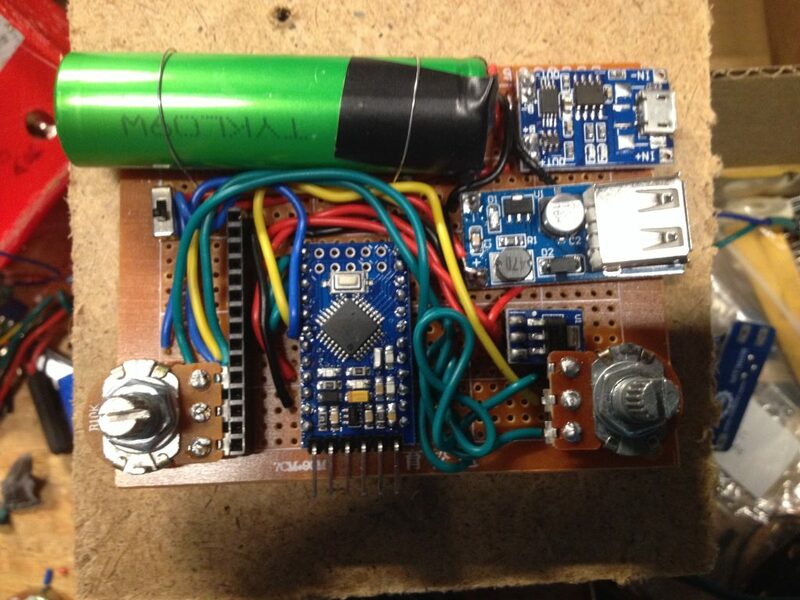 Chinese batteries are one of those shortcuts to completing a project, but not doing it well. Sometimes, it is worth the money to just get the right components. All the Arduinos that I use are Chinese clones of the original open source Arduino boards. They are cheaper, but they function just the same. None of the 50+ that I have personally used have ever caused any problems or dangerous situations to arise, so until the day comes when one dramatically fails (more than magic smoke), I feel completely safe using them as long as I treat them well according to the manufacturer’s specifications. Another one of those long overdue articles. I originally created this pong game 3 or 4 years ago, but it has gone through several great iterations since them. 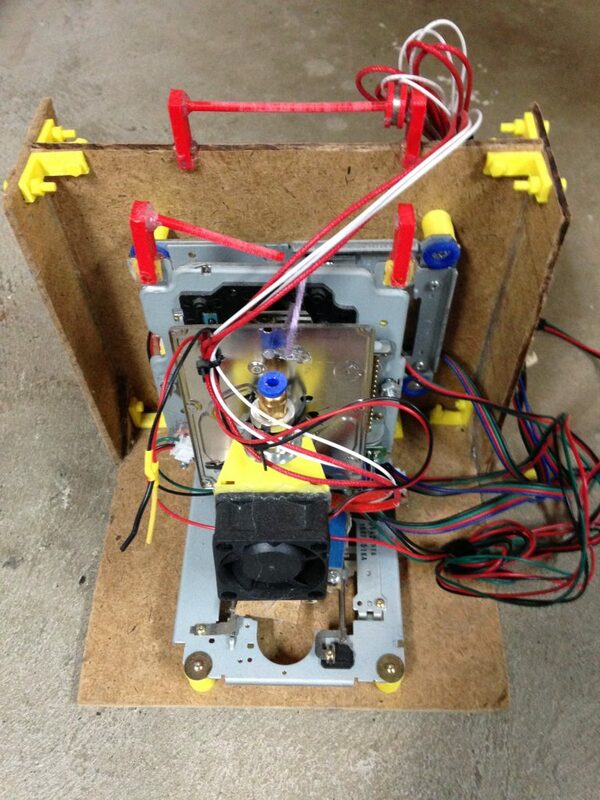 This portable pong game has been a work in progress for many years. The components have stayed the same, but the enclosures and format have changed a fair bit. 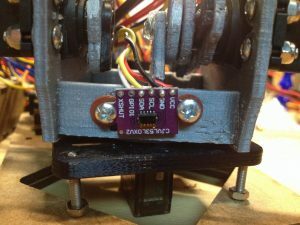 The first version was created on a breadboard and was mostly just a proof of concept and a platform to figure out the code. 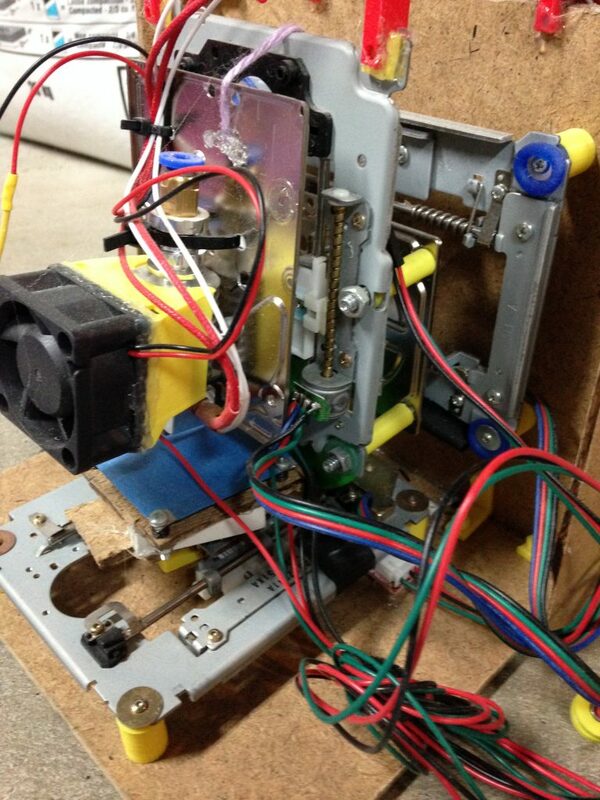 The second version was built inside a 3D printed enclosure and was a mess of wires inside. Next version (number 3), I created on a 7x9cm perfboard and managed to keep the wiring a little bit neater, but it looked much better than previous versions with the added benefit of being more compact. For the final version (number 4), I designed my own PCB to hold all of the components, with an easily replaceable battery holder. As mentioned earlier, the circuit stayed the same throughout all versions (with the exception of a power LED on some). So let’s take a look at what that circuit consists of. 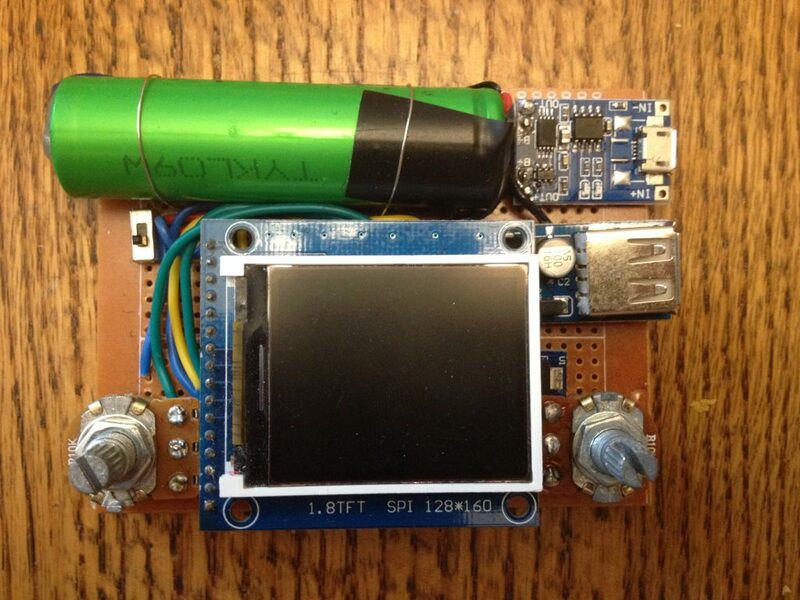 I used an Arduino nano to control everything, a 1.8″ LCD display, 2 10K potentiometers, a switch, a TP4056 charge and protection module, an 18650 cell, and a 5V boost converter. 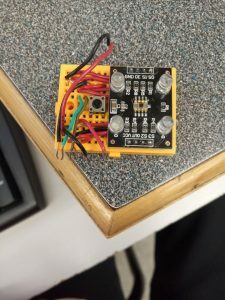 These were wired up in logical fashion so that the 18650 cell was protected and the voltage would be stepped up to 5V for the system, and the Arduino communicated with the LCD over SPI while using the potentiometers as analog inputs to control the paddles. 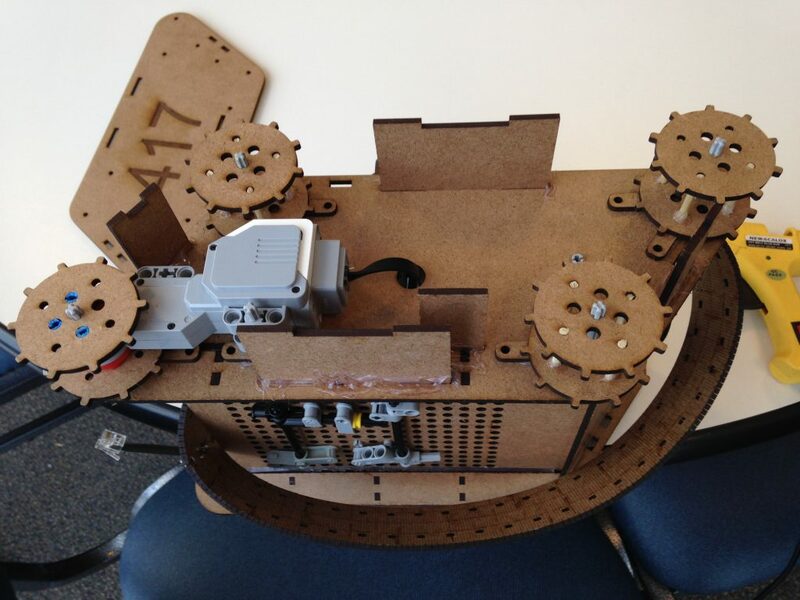 For programming this, and part of the original inspiration for this project, I found an example on the Arduino website that showed 1-player pong, where the paddle could move anywhere as the ball would bounce off of it and the edges. I modified the code for this to make a 2-player version. 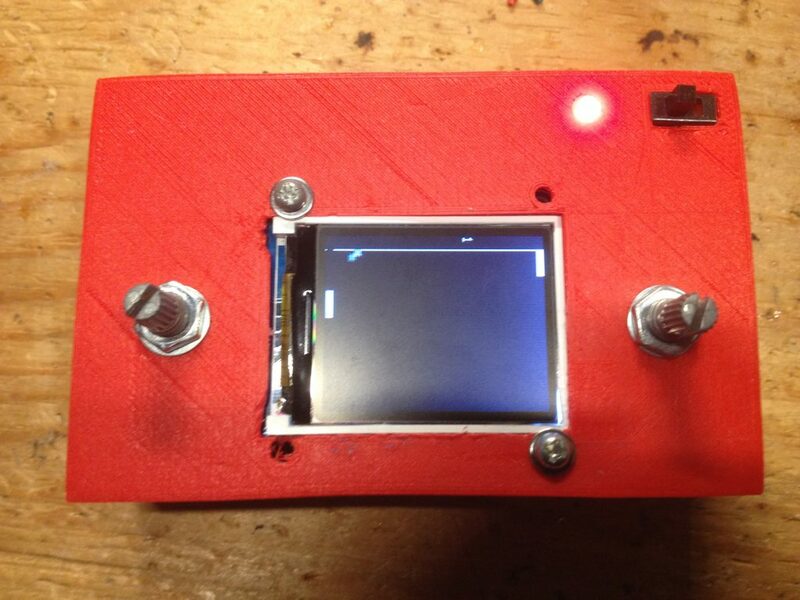 By far, the custom PCB version is the best because it is compact, neat, durable, and easy to wire everything up. 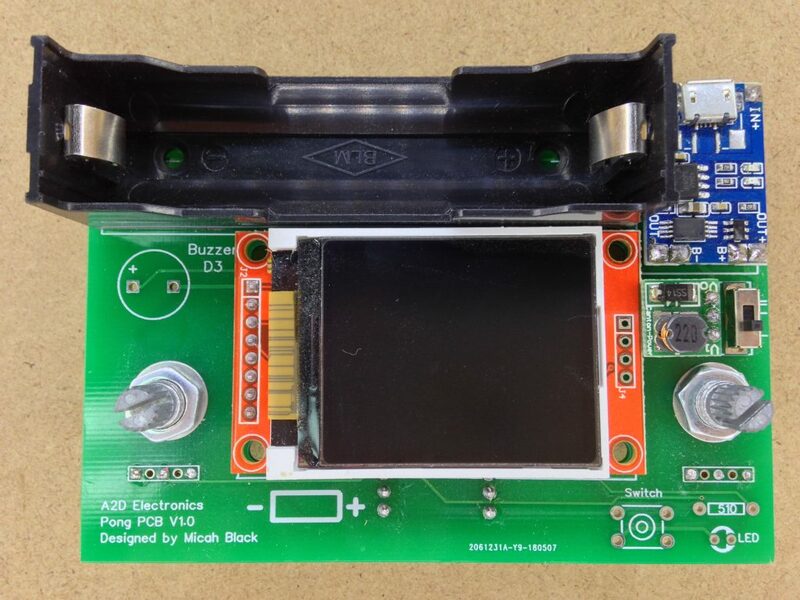 If designing the PCB again, I would definitely use a different software than EasyEDA, as the one thing that was especially annoying was the UI. 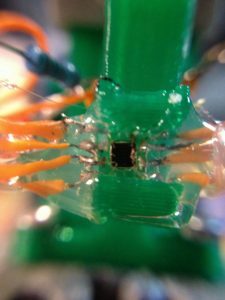 I could not figure out how to create rounded corners on the PCB, and their guides were not much help either. 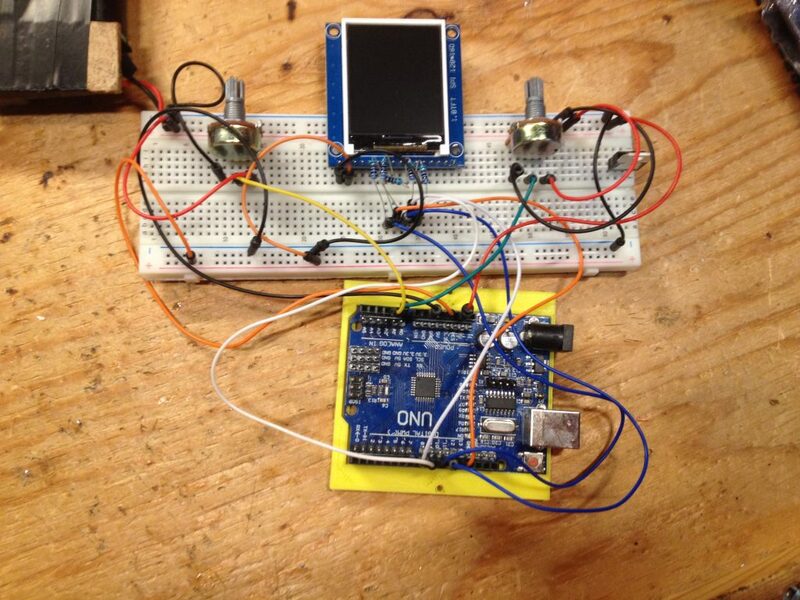 Since designing this board, I have figured out how to do that, but I still don’t enjoy the interface. As for improvements on the code, there are plenty of things I would change – the main ones being a better menu, text facing the right way, and the ball not removing parts of a dividing line. When programming this, I just programmed it up to the point that it worked, and then stopped making improvements, which I somewhat regret now, but is not something I am going to go back and fix, as I have too many other projects that I am working on now. 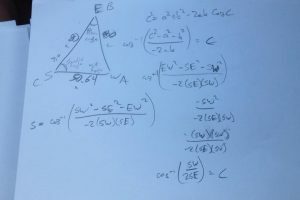 After spending 4 months away from Ottawa (and my business) at university, I wanted to figure out where I want A2D Electronics to be in the future. I have spent a fair bit of time figuring out how to make this less work for me and potential future employees, but I also need some direction on where this business will be going in the future. A2D Electronics exists to provide electronics at a reasonable and affordable price so that anyone and everyone can start making things. It does not exist to make me money. 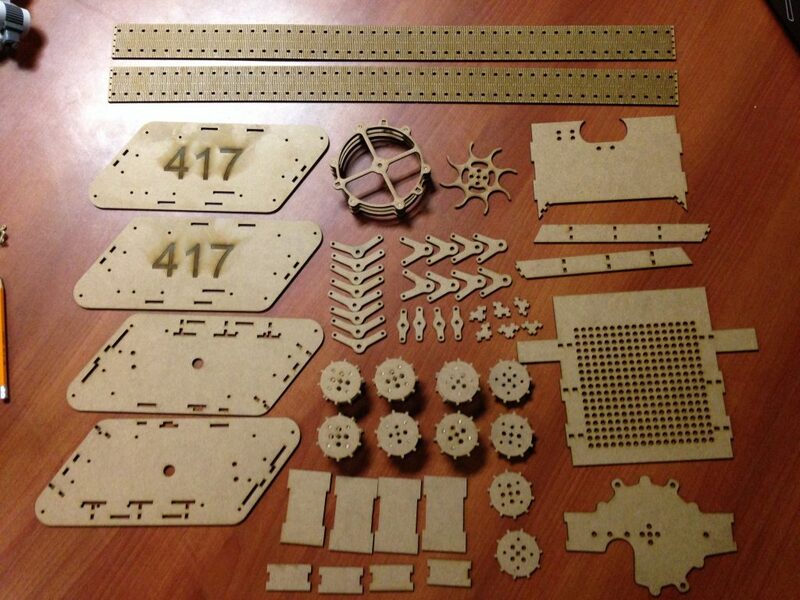 When this started almost 3 years ago now, I realized that the Ottawa maker community had a need for quick access to parts, and I could do something to help that. It was an idea that filled a need and one that I thought could make me some money. Don’t get me wrong it does make money, but only enough to cover the projects that I make and post and some extra to reinvest in inventory and pay a little towards university. The most valuable things that this company has given me are first and foremost the connections that I have made, but also a feel for how business works on a small scale. So where is this going in the future? I want A2D Electronics to continue serving the community. From here on out, that is the main goal. Before we take a look at how that will happen – let’s take a look at the current situation first. To continue serving the community, my focus will have to shift from being an order-packing robot to a community servant. Making those tasks easier, more efficient, and streamlined has been on the back of my mind for the last month or so, and I have come up with several solutions that will be implemented in the near future. However, these changes alone are not enough to better serve the community. One idea that I would like to flush out is to have ‘vending machines’ for electronic components in Makerspaces around the city. These would be amazing, but how would you keep track of everything and accept payments? Those are the questions that I have been dealing with. 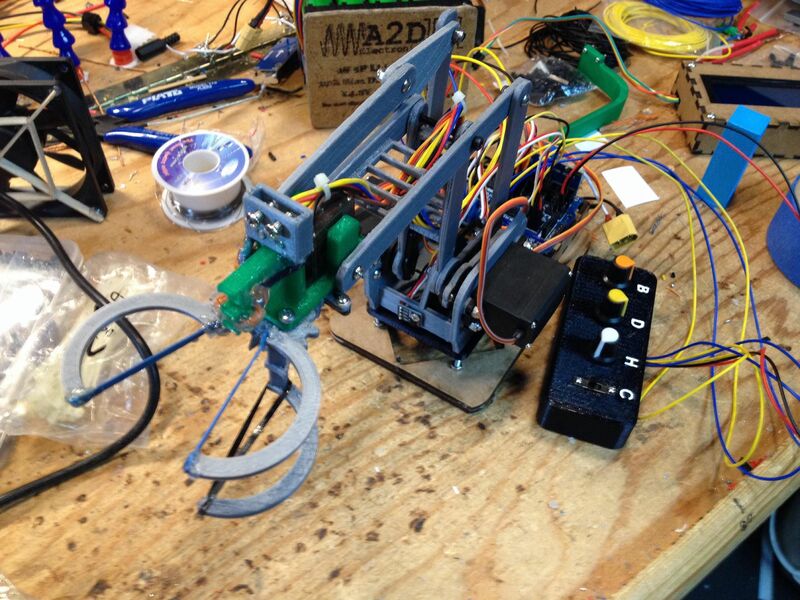 So how does A2D Electronics better serve the community of makers? 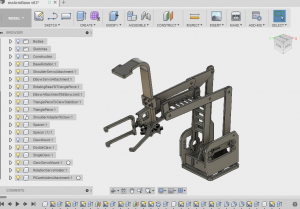 By making access to components easier, faster, and more affordable. Doing this will mean flexible pickup times, possibly multiple locations, more products, and increased efficiency. For the next few months, those items will be my focus. Accurately testing 18650 li-ion cells is a very important step in the process of re-using cells from laptop battery packs, or designing a new battery pack in order to create matched modules and maintain a minimum amount of balancing current to keep the modules balanced. 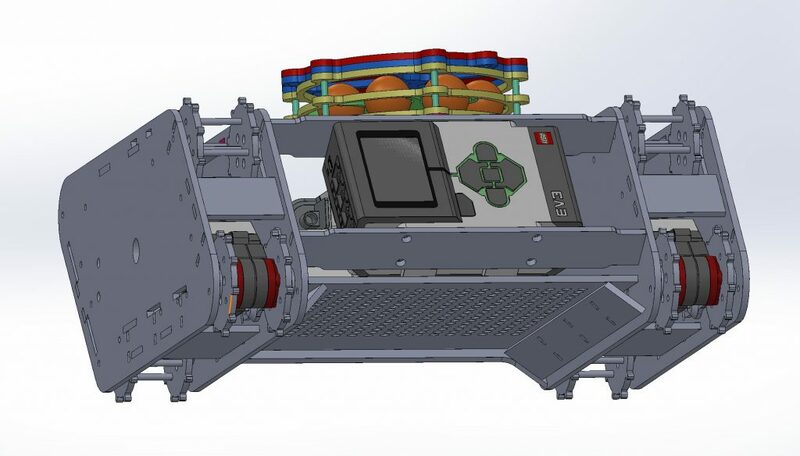 During my first term at the University of Waterloo, I joined Midnight Sun, the solar car student design team and am working on designing a new battery pack for the next car, MSXIV (Midnight Sun 14). During this process, we are looking to accurately test every single cells that we putting in to the car in order to determine their capacity and internal resistance. This will allow us to create perfectly matched packs if the testing is completed accurately. New cells are being used in this car, and the tests must be able to distinguish cells that fall within the manufacturer’s specified tolerance ranges for the cells. That means that the testing method that is chosen must be accurate to 10mAh for the capacity and ideally less than 1mOhm for the internal resistance. And so started my journey of figuring out how to test all the cells in a timely manner while not spending tens of thousands of dollars on proper commercial testing equipment. 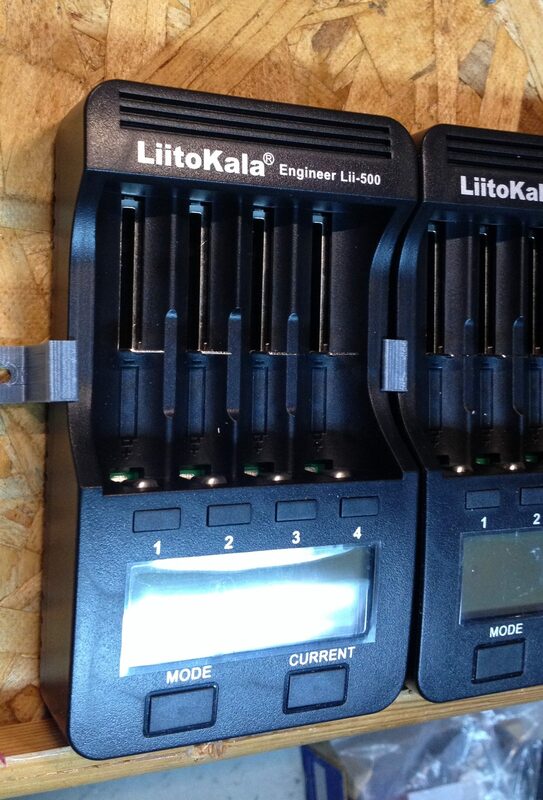 Starting with, one of the cheapest and most popular cell testers on the market, the LiitoKalaa Engineer Lii500. I have 9 such testers, part of my cell testing station, and used 9 different cells to test each one, one slot at a time. Each module was tested with one cell in the same slot multiple times to determine the repeatability of a measurement in the same slot, then the cell was moved to a different slot to see how the measurements compared. The results can be seen on this spreadsheet, and were somewhat surprising. For tests of the same cell in the same slot, the values did not vary too much, within a range of 20mAh. However, when the cell was moved to test different slots, results were changed to a spread of almost 100mAh for some testers, with the average spread between the 4 slots around 50mAh. Given these results, these testers are unsuitable for determining small differences in capacity between a batch of new cells, but for testing cells from laptop pulls they are perfectly acceptable. Keep in mind though, that the results will be within a range of around 50mAh from the value that they show. I do not claim to know everything there is to know about battery packs, but from building my fair share of packs, I am hoping to pass on a bit of knowledge. 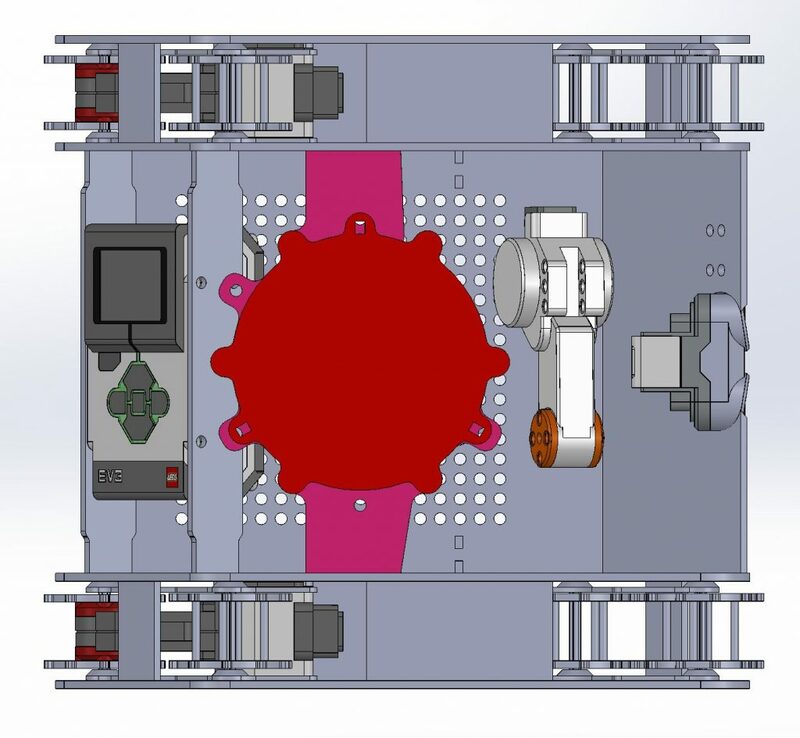 In order to build a battery pack, individual cells must be configured in series and parallel configurations to achieve greater capacity and voltage. Each cell has a certain capacity, voltage, and max current that can be determined from the cell’s datasheet. If a datasheet cannot be found, a general safe rule for 18650 style cells is a 1C (1 times the cell’s capacity) discharge rate. There are a few basic rules to remember. Achieved by directly connecting the positive ends together and the negative ends together (+ to +, – to -). Capacity of the cells are added together to achieve a higher capacity battery. Voltage of the cells remain the same. Before connecting all the cells together, be sure that all cells are at the same voltage (within 0.05V). If there is a large voltage difference between the cells, when you connect them in parallel with a wire (0 ohm resistance) then when connected together, the cells will try to balance out the voltage. With a larger voltage difference, the current flowing between the cells to balance them out will be large – and charging li-ion cells quickly will create heat. Cells connected in parallel act as a single, larger capacity cell. Another common question with parallel cell connections is if connecting cells with different capacities will be problematic. This in fact is not a problem. When discharging the cells with different capacities in parallel, the cell with higher capacity will discharge at a higher current in order to keep the voltage between the cells the same. If both cells discharged at the same rate, the cell with lower capacity would drop voltage quicker. Since the cells are parallel the voltage on each cell must be the same, so discharging cells at the same rate does not work. Both cells must maintain the same voltage, so the cells must discharge at different rates relative to their capacities. Achieved by connecting the positive end of one cell to the negative end of the next (+ of Cell 1 to – of Cell 2). Capacity of the cells remain the same. Voltage of the cells is added together. Before connecting cells in series, it is advised but not necessary to balance the cells. 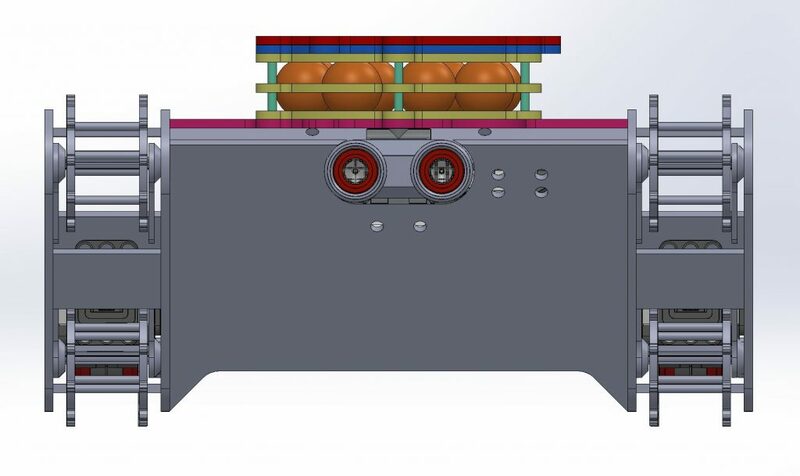 The main drawback to connecting cells in series is that the cells must always be monitored to keep avoid over-discharging or over-charging individual cells. The cells that are chosen to connect in parallel must ideally have the same capacity, age, and internal resistance (capacity is the most important) so that when charging the pack, the cells do not become unbalanced. When charging the pack, if one cell has a lower capacity than the rest, that cell will reach full charge before the others, but the battery will not be at a full charge voltage yet, so it will keep charging. The cell with a lower capacity will now be overcharged and risk heating up and going into thermal runaway. A similar thing will happen when discharging – the cells with a lower capacity will be discharged to a lower voltage than the rest and could be over-discharged if not properly monitored. Because of this, it is strongly advised to have a Battery Management System (BMS) that is able to monitor the voltage of the pack and prevent over-discharging or over-charging cells. Higher end BMS systems will also include cell balancing – they will keep all the cells at the same voltage level either by bleeding off the extra energy in the high capacity cells through discharge resistors as heat (passive balancing), or by transferring charge of the high capacity cells to the low capacity cells through transformers or other methods (active balancing). Active balancing is generally the better option, as it does not waste excess energy, but it is more expensive to implement. A battery with X cells in parallel and Y cells in series is referred to as XPYS. So a battery with 3 cells in parallel and 2 cells in series is referred to as 3P2S. This battery has 6 cells in it with 3 in paralled, and 2 of those parallel groups in series. 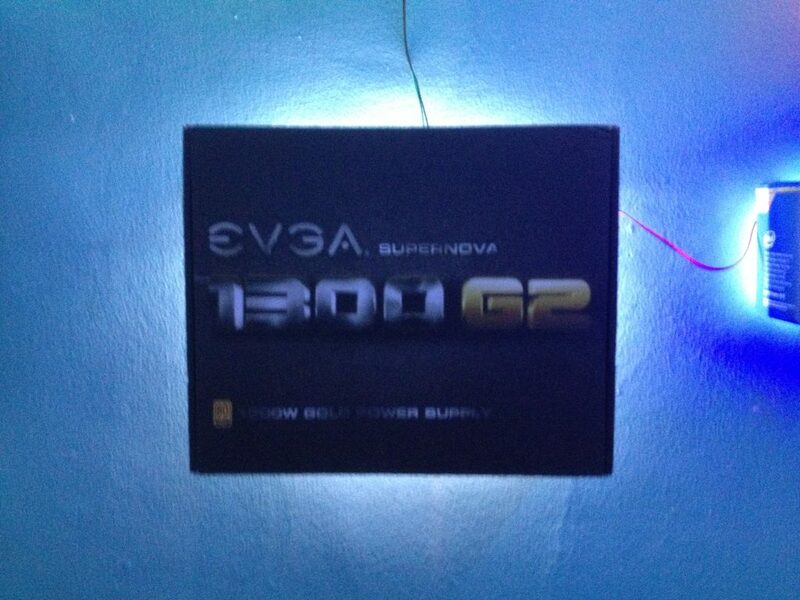 It has 2x the voltage and 3x the capacity of a single cell. The order of the P and S designations in the battery can mean different things. I have heard differing opinions on about whether this 2S3P battery is the same as a 3P2S battery. Both batteries will contain 6 cells, but the order of how they are connected will differ slightly. 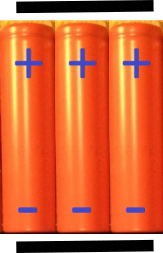 A 2S3P battery will have 3 series strings of 2 batteries connected in parallel, while a 3P2S battery will have 2 series sets of 3 cells in parallel. 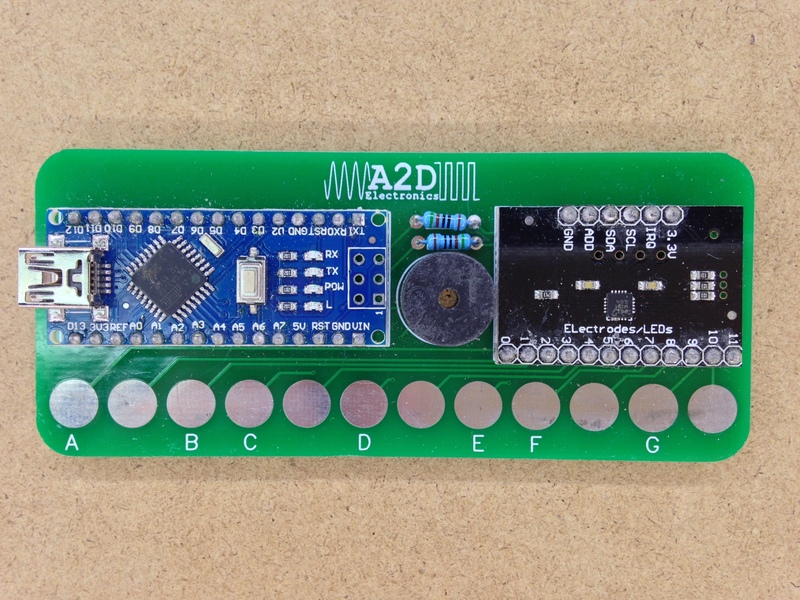 The main difference with the 2S3P battery would be that there is no parallel connection across the first set of 3 cells. Each series string of cells should have its own BMS, as all 6 cells could be at different potentials (voltage). It is advised to go with a large parallel group of cells, and put those large parallel groups in series if possible, unless there are problems implementing such a system. When connecting multiple LiPo batteries in parallel through their power connectors, each individual cell should be monitored, as this is a 2S3P style system. 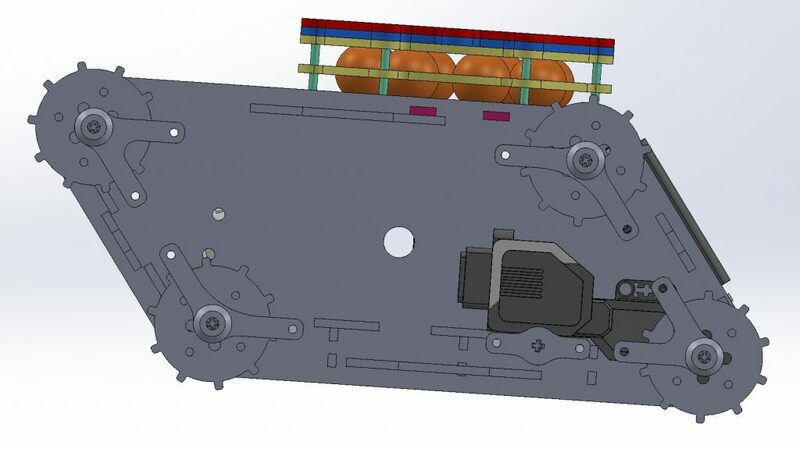 A modular battery pack might also make use of this design so that some cells can be removed, while still maintaining the correct voltage to operate whatever device it is powering. The naming and the advice here are not strict rules, but just some of what I have come across on my extensive battery building journeys. If interested in more information on lithium batteries, here is a great article. It leans more towards information on charging and storage safety for LiPo batteries, but has tons of great information.